India has abolished import taxes on onions in the latest attempt to control prices of the staple food which have more than doubled in a week. The customs duty would be cut from 5% to zero, Finance Secretary Ashok Chawla told reporters in Delhi. The price of onions has risen to an eye-watering 85 rupees ($1.87; £1.20) per kg from 35 rupees only last week. The rise has been blamed on unusually heavy rains in growing areas, as well as on hoarders and speculators. On Monday, the government banned exports of the food, a basic ingredient in many Indian dishes, until 15 January. 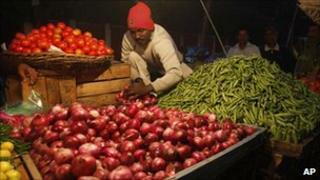 The country has also begun importing onions from its neighbouring rival, Pakistan, to ease shortages. Indian onion crops have been damaged by unseasonal rains in the bulk producing western states of Maharashtra and Gujarat and in southern states. In an editorial on Wednesday, the Times of India newspaper called for "tough punitive action" if claims that officials have colluded in the hoarding of onions in growing areas were found to be true. NDTV reports that Bangalore hotel chefs are racking their brains for ways to serve up popular south Indian dishes such as onion dosas (pancakes) - without any onions. The rising cost of living is a pressing concern for most Indians. Food price inflation has retreated over recent months, but remains at a high of nearly 10%, a worry for the ruling Congress party ahead of a number of important state elections next year.